This option is great for those who already have the resources to support manufacturing. In this relationship, SparkFun assumes the responsibilities of storefront management, inventory storage, shipping, and customer service. You, on the other hand, deal with manufacturing and assume all the risks inherent to that. This allows you to have more control over your product (revisions, pricing, documentation, etc). 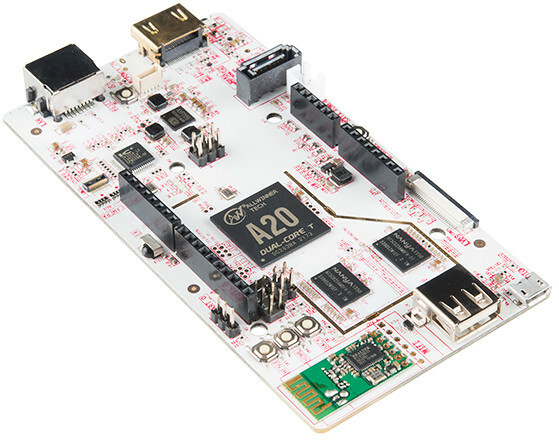 A great example of this relationship in action is the pcDuino. The pcDuino is designed and manufactured by our friends at LinkSprite. They support a community, publish the documentation, and handle all manufacturing, but aren't as interested in hosting a storefront. So we resell it! As a bonus, the end-customer can save on shipping (or get it for free) when resistors, batteries, switches, and other components are inevitably added to the order. Purchasing Your Product -- To begin, our purchasers can work with you to work out prices, payment methods, and inbound shipping requirements. We'll need a decent distributor margin to give us room for our distributor and education pricing. We'll work out those details in an email. 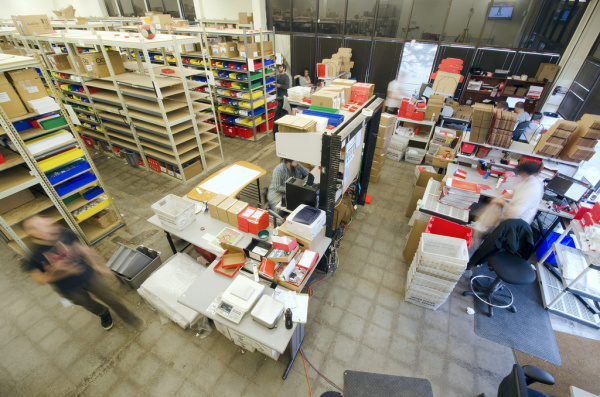 Storing Your Product -- Once we bring the product in, we've got a warehouse equipped to store it until it sells. Managing Storefront -- We'll post up a product page with all of the relevant descriptions and documentation-links to the product. Shipping Your Product -- Once the order comes in, we'll grab it from the inventory shelves and ship it away. Customer Service -- If there are any problems before or after an order, our customer service team can help sort it out. (First Level) Tech Support -- Our crack technical support team can field initial tech questions (via email, chat, or phone calls), but we may have to refer the tough ones to you. Manufacturing -- In this relationship, you'll manage all of the part sourcing, manufacturing, and assembly responsibilities. That includes testing the product for complete functionality. Keeping Supply Up with Demand -- Some of the greatest products are sunk because they can't stay in stock. We want to keep your product in stock as much as possible, so we'll work with you ahead of time to understand the lead times of your product. Documentation -- Products that are well-supported, by datasheets, user's manuals, and tutorials, really stick out to us. This is a load we're willing to share (see below), but the most attractive products to us are those with the proper documentation to support them. Sticking Around -- Whether your product needs future firmware updates or customer support, we need to be able to stay in contact with you for the long term. Marketing -- We both want to see your product sell. We'll pitch in on getting the word out, but we'll need your help too. Documentation/Tutorials -- Generally we're looking for products that are already well-supported through tutorials, datasheets, and user's guides. We're always excited about playing with new toys and documenting our experience, though -- so we can help out with tutorials here and there. Technical Support -- We can handle first level calls and emails. For the real brain-stumpers, we'll refer customer questions to you, the all-knowing-product-creator. Many products in our catalog were born out of a crowdfunding website, like Kickstarter or Indiegogo. We're happy to work with you, if your product is on this path, but there are a few caveats. If you aim to approach us with a crowdfunded product, it's best to do so after it's been funded, or at least while it's on a trajectory to be funded. But, most important of all, we need to know ahead of time how far out your product is from shipping. Obviously this is a sticking point for a lot of crowdfunded projects. If your product failed to meet its crowdfunding goal, we might be able to work together to still make it a reality. Check out the next page to see how we can collaborate to produce your widget. 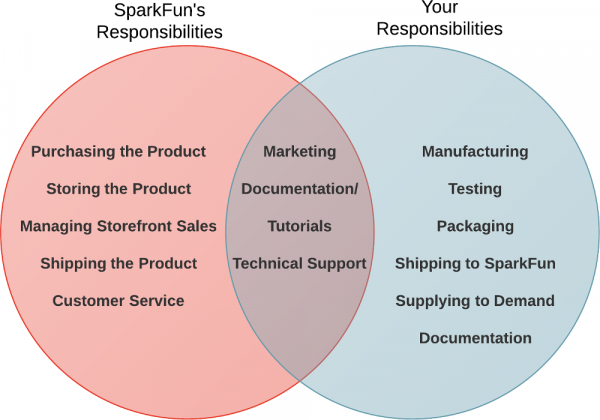 GroupGets + SparkFun = GetSparked! Have an existing product already that you plan to sell in SparkFun&apos;s catalog but it requires a high minimum order quantity? Try collaborating with GroupGets to get something cheaper in volume by working with others and selling to a group of buyers. GroupGets is a type of crowdfunding platform for hardware developers to test their prototypes in the market. Developers launch a "campaign" on the GroupGets site, and instead of receiving financial donations like Kickstarter, supporters of the product place an order. When a certain amount of orders are placed, GroupGets helps that developer run a small batch of their product. They are a crucial step in the startup process for entrepreneurs in the hardware space because they facilitate a connection between those entrepreneurs, the customer, and small batch manufacturing. 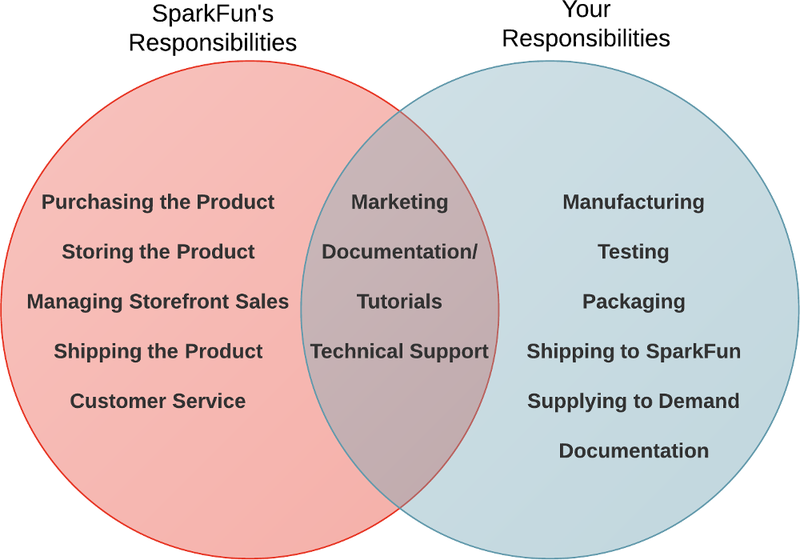 If your product performed well on GroupGets in terms of sales and user feedback, they connect you with SparkFun for the next steps on how to get into our online catalog. For more information, check out the button below.